Hotel rooms are plentiful in the New Orleans, except during Jazzfest, Mardi Gras or when a large convention is in town. Rates are lower in the summer (June, July, and August) and during the Christmas season. Most hotels are centred around the French Quarter and surrounding neighbourhoods, such as the Central Business District (CBD). These New Orleans hotel prices are for a double room per night; breakfast is not included unless specified. Hotel tax is 13% plus US$1-2 per room per night (depending upon the number of rooms in the hotel). One of the classic New Orleans luxury hotels, the Monteleone has been wowing visitors since 1886. Rooms are decked out with plush curtains, high-thread-count sheets and large flat-screen TVs. The lobby is suitably grand, and the Carousel Bar is something of a local haunt for cocktails and people watching. Telephone: +1 504 523 3341. A tasteful, small property on the edge of the French Quarter, this luxury Victorian-era mansion dates back to the late 19th century. The interiors are suitably plush, with antique furniture, original artwork and all the mod cons you'd expect (iPod dock, LCD TV, Wi-Fi and minifridge). There's also a fairly large outdoor swimming pool. Telephone: +1 504 944 2255. Old books, fine artwork, Oriental rugs, American and European antiques: it is the little touches like these that make this hotel unique. The two restored 1830s townhouses have spiral staircases, balconies and patios. Sweet olive, magnolia, guava and ginger grow in the courtyards. Each of the 19 rooms and 14 suites are furnished with antiques that are accompanied by Frette Egyptian cotton bed linen, Wi-Fi, data ports and two phones. Telephone: +1 504 522 0570. If you want good-value accommodation that's right in the middle of the action, then this solid hotel is hard to beat. From its entrance, you can hear the buzz of Bourbon Street, though you can also see the serenity of St Louis Cathedral. Some of the suites have balconies overlooking Bourbon Street itself, and there's a salt-water pool. Telephone: +1 504 523 2222. 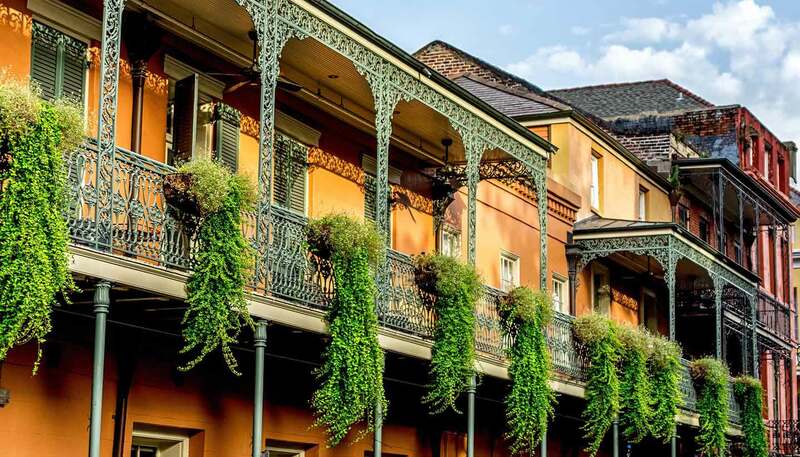 Set in a renovated French Quarter property just a block from the action on Bourbon Street, Grenoble House provides modern suites with old-timey touches, such as exposed brick fireplaces, hardwood floors and crown molding. Full kitchens make for ease if you want to eat in, though the fabulous restaurants of New Orleans will always beckon. The central courtyard has a sparkling swimming pool and is a welcome respite from the heat. Telephone: +1 504 325 2271. This historic former rice mill in the Warehouse District looks across at the mighty Mississippi River. Plantation shutters and exposed brickwork give the property its character, as well as up-to-date touches such as high-speed internet and ergonomic desks. There's also a restaurant, bar and fitness centre. Telephone: +1 504 524 8200. This unassuming building on a quiet stretch of the French Quarter is recorded back as far as 1775, almost to the city's own beginnings. A former bordello site, the hotel now has 111 modern rooms and a host of old, atmospheric cottages. The pool and courtyard are nicely secluded and the hotel bar, May Baily's Place, also harks back to those hedonistic times. Telephone: +1 504 586 1800. Formerly a 1903 'skyscraper' office building, the Hampton Inn is just two blocks from the French Quarter. Every Monday to Thursday 1730-1900, the lavish lobby is the scene for the complimentary manager's reception. Rooms are large and comfortable with high-speed Internet and king-size or two double beds. The hotel also has a gym, concierge, coffee shop and parking for a fee, along with access to Spa Atlantis, directly across the street. The daily hot breakfast buffet is included. Telephone: +1 504 529 9990. This hotel has great facilities for bargain prices, such as guestrooms with either king-size or two double beds and large bathrooms, and some have microwaves. In-room business facilities include data ports, oversized desks, free high-speed Internet access and local calls. Add to that, cocktail lounge, business centre, a heated pool, and fitness centre, plus a free breakfast. The location is convenient for the French Quarter, Superdome, downtown, and the convention center. Telephone: +1 504 598 9977.